It's seems like I've been seeing this quote everywhere lately. I tend to read into things like that, when you are constantly being reminded of something over and over, especially since this is one of the things I've tried focusing more on in the past year. I really feel as though things have shifted...instead of looking for the good in people and rooting for them, people are so quick to point out the bad. Or what people do wrong. If you know me in real life, you'd know I wear my heart on my sleeve and if I'm sad about something, you probably know it. I genuinely care a lot about the people in my life. Sometimes to a fault. As a friend, I get so concerned and worked up if I hurt one of my girlfriends feelings, or if they're going through a difficult time (even other bloggers whom I've never met). You know when you read into things way too much and it consumes your mind? That kind of thing. That's not to say I don't ever speak up if something is bothering me, because I definitely do, but I care just too much sometimes. I'm sure most of this stems from my Mom's passing because I'm constantly scared about losing people. Or taking someone for granted. In our world today, now more than ever, we need focus on the positive in people and what they do right. Stop competing with each other, but instead support them with their successes and let them inspire you. Surround yourself with people who make you want to be better and motivate you to cross those things off your bucket list! I'm not really sure where I'm going with this, but it's just been something that's been on my mind. It's a heck of a lot easier to point out everyone's flaws, but how does that make you feel afterwards? It takes more effort and character to acknowledge the good that people do. Instead of bashing what you hate, promote what you love. How was everyone's weekend? We had an amazing time in Cleveland. Truly one for the books! The West Side Market was even more awesome than I was expecting (came home with corn on the cob, green beans, sausages and beef jerky for Billy, and snacked our way through the entire thing!) We got dinner at an Italian restaurant on Saturday night called D'Agnese's, which was absolutely amazing! 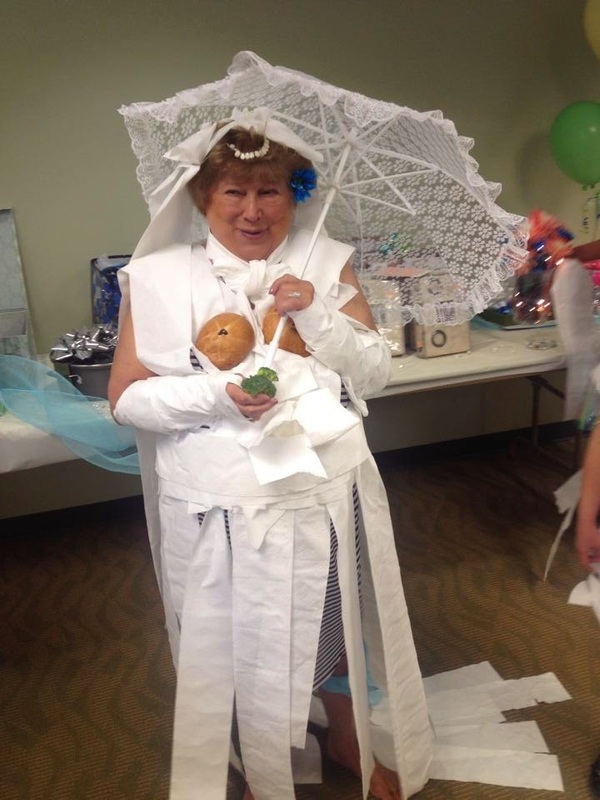 Billy got some golf in with his family and probably the best part of the weekend was dressing up Billy's grandma, who is the sweetest woman in the world, as a "bride" with toilet paper during a bridal shower game for Billy's cousins fiance. She was such a good sport! I'll be back tomorrow to share about a new juice company I'm loving! This was such a great read for this Monday morning. I, too, wear my heart on my sleeve and for someone who is a sucker for good quotes, this one was perfect! The photo of Grandma is epic. I always imagine myself being a cool Grandma and down for anything. And now I'm craving Mexican. I think I might make some cheesy enchiladas! I TOTALLY agree! This whole post reminds me of one of my favorite quotes from one of my favorite movies, "If you look for the bad in people, you will surely find it!" We should spend more time building each other up (especially as women) and not tearing each other down! Thank you for posting this today! It was exactly what I needed to read Monday morning and serve as a reminder for a new week...I just finished reading The Happiness Project, by Gretchen Rubin and this was a big part of her resolutions. If you haven't read it, I recommend it - it fits nicely with your daily reflections. Yes!!! I could not agree with you more. If people could just come to terms with the fact they aren't going to like everything about everyone, but just rather pick out a few things that they do like about them and run with that instead of shutting them out because a few random flaws. We're all guilty of it, so we ALL can do better! Thank you for this, Katie! I definitely can relate.. and it was a refreshing post to kick off the work week with:) Keep Smiling! I think that is why I really enjoy blogging. It seems like women building one another up instead of in real life people just trying to outdo one another. and your grandma! the buns....loved it! happy cinco friend!! Truly a great reminder for a Monday. And a perfect way to start the week. Thank you!